Let me start by saying that I am old (archaic) and have been riding bikes since my teens so I have ridden and enjoyed many bikes and I do put a lot of miles on my bikes since I use them as daily drivers throughout the year except for the worst of winter time and lots of pleasure rides. I could see this gorgeous bike sitting there, so what is this? Never seen one of them before....GSX-S1000...**** that is badass!! Wait..they have 2 of them...A used 2016 and a new 2018. I've since read reviews and as much info as possible and then another thing I like to do when I'm looking is join a forum for the vehicle so here I am to get more info. Seems that the general consensus is that it is a great bike.... any issues to pay attention to? Any pointers when buying one? What should I expect out of it, a very long life? Anyways I've been back to the dealer again yesterday for something else but gravitate right back over to them while I wait. I've stopped just short of signing the paperwork and riding off. Decisions decisions........ buy the RC or the S1000..... Now ideally I won't mind to own both but can't buy both this year. Oh and the Vic XC stays too, that will never go. I look forward to learning much from you guys!!! Gsx-s1000 is a great bike, it is a current production bike though that will be available new or near new for a while. A mint rc51 is more rare. Welcome to the forum. I went from an SV1000s to the GSXS1000F. The SV is pretty much Suzuki's RC51. They are almost Identical in ride and performance, also in NOT being comfortable for us old guys!!! I loved the SV but after an hour or so the neck back and wrists were feeling it. I have the 1000F and like you, I ride alot. I've already installed a touring screen and the added wind protection is appreciated. So far I have absolutely nothing to fault with this bike and would recommend it to anyone. I'd get the 18 over the 16 as they have better fueling and throttle response and a few more Clydesdales!!! 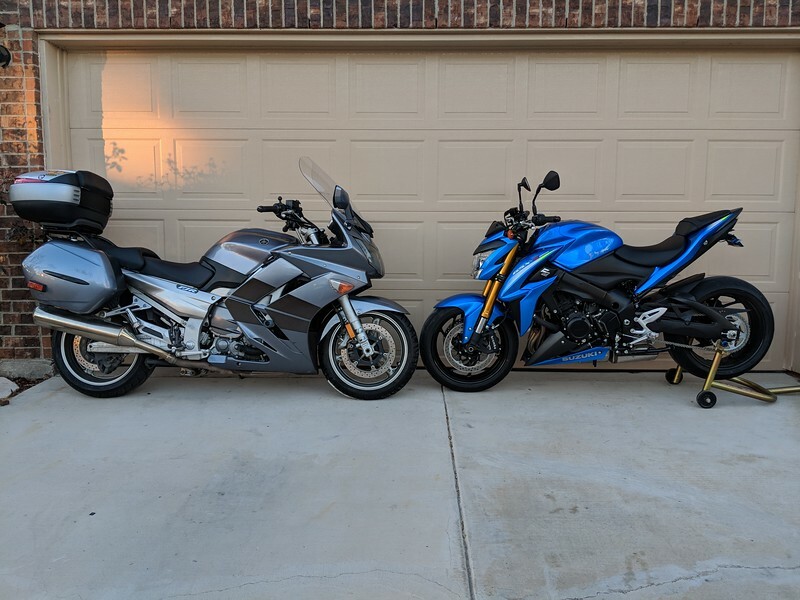 SV1000s pales compared to an RC51. SV1000 was a detuned TLR and even the TLR had to give way to the RC51, and I say that having loved my TLR dearly. Sir, I do NOT envy you your decisions. An RC51 has also been on my bucket list as well, however no more clipon bikes for me, for the road anyway. If you can find a way to swing it, I'd get the RC now, and then get the GSX later. A new or clean GSX will be easier to find than an RC51 for sure, then you can have both. As for filling the sporty side next to something more suited to touring, I totally get that, and it really is a great combo to have in the garage to choose from. That would be a good garage to have no matter what kind of riding you want to do, unless you want to get dirty, then you need to add another bike to the garage. It gets expensive. By the way, I kept the SV. It makes all the right noises (Dan Moto slip ons) and has all the right feels and it is a blast to ride!!!! Gixxer what are you comparing to say the SV pales compared to the RC. They are with in the same 10th of a second thru the 1/4, there is only a 2mph difference in 1/4 mi mph, probably due to the RC having 10more hp than the original non fuel injected SV and the weight is with in a few pounds of each other. The only comparison I've seen are in early tests by MCN in their yearly performance index issue. I know everyone loved the Honda and the only one I ever rode I really liked and it "felt" alot quicker that the SV, but I feel it was even more sporty in riding position and harder to stay on for any length of time more than an hour or so. I agree with the guy that said the SV1000 was the best bike nobody bought!!!!! I was discussing with a coworker and expressed the same sentiment that I should get the RC first because the GSX will be readily available for years in the future but what I should do and what I wind up doing are different at times haha. I have also through much research over the years have come to understand that while still basically the same platform the RC does outperform the SV in every area. I may be wrong but that's what I've read. I have not seen a newer bike that I thought WOW about when I saw it until I saw the GSX. Thus the WOW is very tempting. Seems like so many years ago I rode a RC51 of the first year release series. As I remember, there was an updated version a year later to fix the niggles in the first. Honda is better than Suzuki in this. Fueling any one??? I would think that you have had a few rides on different days of the RC51 right ? The ride position of a 2005 year sportsbike is more extreme than offered today, and my history at 66 suggests that you too will find the GSX-S1000 a more sustaining ownership experience. When a bike says WOW to you, it's 90% there for you. I think the Honda has a few miles up by now, so it's not a tight bike anymore and do you know mechanically how healthy it is and what the maintenance service costs will be for your expected ownership? Edit, the RC51 was called the VTR1000 SP, and SP2 in my Country and Overseas. Last edited by Slower and Slower; 03-29-2019 at 10:53 PM. I have the F version of the GSX-S. I absolutely love it and have had zero issues. It sill just amazes me every time I get on and am able really twist the throttle. I had never ridden an inline 4 before this bike (but I did own a V4). The GSX-S just sounds great and has more power than I'll ever need. I've never ridden an RC51, but it's always been one of those bikes on my list of bikes I'd like to own, along with the SuperHawk. I really like the versatility of a "sport" class bike with ergonomics that make it a joy to ride for long hours in the saddle. I know it's a totally different bike, but I think you will love it if you try it.